This week’s lesson says many words that sound almost “right”. In fact, unless one understands the Adventist worldview and its contrast with the Bible, the problems in this week’s lesson are hard to define. Nevertheless, there are some statements which reveal the underlying confusion of this lesson. While it is true that Jesus demonstrated to us how a saved, born-again person will look at the world and will depend upon the Father for moment-by-moment strength and wisdom, Jesus did not come to show us how to live in the “Adventist sense”. We are never asked to look to Jesus and model ourselves after Him. We are asked to BELIEVE in Him. We are asked to trust Him and place our entire faith in Him. When we are born again, we then receive from Him all that we need for life and godliness (2 Peter 1:3). Adventists see themselves as following Jesus’ example in keeping the Sabbath and conducting a teaching and healing ministry. From an Adventist perspective, modeling their lives after the law-abiding, healing and teaching Jesus is what they believe they are called to do. This modeling is not what the Bible asks of us. Rather, it asks of us to surrender to Him everything we value and love, even the the things we think we believe, and allow Him and His finished work to define us totally. This was Jesus’ advice to the rich young ruler. Jesus let him know that keeping the law could not and would not save him. He had to give up what he loved and follow Jesus. The law-keeping did NOTHING to qualify him for eternal life. Jesus established that he was a very good law keeper, and Jesus told him that didn’t help. We are called to believe, not called to follow Jesus’ example. Now if perfection had been attainable through the Levitical priesthood (for under it the people received the law), what further need would there have been for another priest to arise after the order of Melchizedek, rather than one named after the order of Aaron? For when there is a change in the priesthood, there is necessarily a change in the law as well. For the one of whom these things are spoken belonged to another tribe, from which no one has ever served at the altar. For it is evident that our Lord was descended from Judah, and in connection with that tribe Moses said nothing about priests (Heb. 7:11-14). Because of Jesus’ fulfillment of the law, the law is obsolete for Christians. Because Jesus is of a new priesthood, the law must of necessity CHANGE. The Decalogue and the Torah law were given on the basis of the Aaronic priesthood. In other words, the Old Testament priesthood was necessary for the law to apply. With the fulfillment of the shadows of the Old Testament priesthood, Jesus is a priest of a new order: Melchizedek. A NEW law is in place because we have a NEW priesthood. Let this be clear: Job’s suffering was not refuting ANY charges against God. In fact, Satan has never charged God with unfairness. Trying to understand Job from a perspective of a supposed great controversy twists the profound revelation of a sovereign God which the book of Job is primarily teaching. It is vitally important that we understand that God is SOVEREIGN over all creation, including Satan. Satan is not an equal-but-opposite power roaming the universe accusing God falsely. On the contrary, Satan is a created being who does not believe. He is one spiritually dead created being who used to be an angel in heaven. He has great power, but his power is entirely under the authority and control of his Creator. Satan cannot do anything his Creator does not allow him to do. 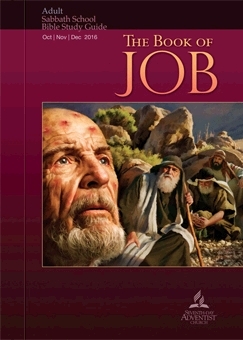 Even in the book of Job we see God allowing Satan to torment Job, and God set the parameters within which Job had to operate. He was not allowed to go beyond those boundaries. So to keep me from becoming conceited because of the surpassing greatness of the revelations, a thorn was given me in the flesh, a messenger of Satan to harass me, to keep me from becoming conceited. Three times I pleaded with the Lord about this, that it should leave me. But he said to me, “My grace is sufficient for you, for my power is made perfect in weakness.” Therefore I will boast all the more gladly of my weaknesses, so that the power of Christ may rest upon me. For the sake of Christ, then, I am content with weaknesses, insults, hardships, persecutions, and calamities. For when I am weak, then I am strong (2 Corinthians 12:7-10). Our suffering is for the purpose of our discipline (see Hebrews 12:1-12) and for the purpose of God’s power being perfected in our weakness. Job did not understand that God allowed him to suffer NOT to prove that he would stay faithful and thus refute Satan; rather, God allowed Job to suffer so that Job would learn that he didn’t understand God’s ways. Job had to learn that his faithfulness did not get “repaid” with blessings or earn God’s protection. He had to learn that God was sovereign and far, far more inscrutable than he had any idea. God’s showing Job the reality of His creation and the knowledge and wisdom that underlay creation was not primarily to remind Job that God was “Creator”. Job KNEW that fact. What Job hadn’t contemplated was the utter sovereign power God excised over all creation, calling stars by name, crating and managing leviathan and the foundations of the world. Job had to be brought face to face with a God whose power could create out of nothing and destroy at the glance. Job had to acknowledge that he did not know HOW God worked, that his own faithfulness did not make God beholden to him in any way. Job didn’t deserve God’s protection because he was good. Job had to trust God because God is good. Job’s obedience wasn’t the basis for God’s blessings; rather, Job’s blessings AND SUFFERINGS were the outflow of God’s faithful, sovereign goodness and were for the purpose of God’s glory. “Oh that my words were written! Oh that they were inscribed in a book! Oh that with an iron pen and lead they were engraved in the rock forever! For I know that my Redeemer lives, and at the last he will stand upon the earth. And after my skin has been thus destroyed, yet in my flesh I shall see God, whom I shall see for myself, and my eyes shall behold, and not another. My heart faints within me! If you say, ‘How we will pursue him!’ and, ‘The root of the matter is found in him,’ be afraid of the sword, for wrath brings the punishment of the sword, that you may know there is a judgment” (Job. 19:23-29). The great controversy model turns reality upside-down. It says that faithful humans refute Satan and uphold the character of God. This idea is nonsense. God is utterly sovereign; how does a creation vindicate the Creator? We do not share God’s “incommunicable” attributes. We are not omniscient, omnipotent, omnipresent, eternal, or divine. We are utterly unable to defend or vindicate the One who upholds His own creation in Himself (Col. 1:17). Job repented in sackcloth and ashes at the end of this book because he finally realized that God did not operate on the principles of “fairness” that humans see as ultimate justice. God is Sovereign. He sees what we cannot see, and He allows us to suffer because He knows His plans and purposes. He will glorify Himself because He is sovereign Creator of all, and Satan is a defeated foe ALREADY because of the shed blood and substitutionary death of the Lord Jesus that propitiated for our sins. Because of the Lord Jesus’ substitutionary atonement, God’s justice is revealed. god cannot excuse sin. It must be paid for with death, just as the law states. Jesus took that curse and fulfilled the terms of the law. Jesus, the Creator of all, became sin for us (2 Cor. 5:21) and became a curse (Gal. 3:13). in order to justly deal with human sin. God IS fair. He took the punishment required by His own law in order to give us life. If we believe, we pass from death to life. Satan is an accuser, an deceiver, a liar like his father the devil. It is a lie of Satan that God is accused of being unfair for requiring obedience. There is no such question hanging in the universe. Job realized, as we must also, that God is utterly sovereign. Nothing happens apart from His permission and sovereign care. We are His when we trust the finished work of the Lord Jesus. Dear reader, as Christmas approaches, consider what it meant that the eternal Son took on flesh and became sin for you and for all. Are you willing to give up what you love the most, as Jesus told the rich young ruler, and trust Him alone? Are you willing to give up your “control” over your world and allow the Sovereign Lord to be sovereign over you and your life? Whether or not you trust Him, He IS sovereign over you. If you trust Him, however, you will find yourself ushered into His story. He will give you forgiveness, a new heart, a new identity, and the work He prepared in advance for you to do. Copyright 2016 BibleStudiesForAdventists.com. All rights reserved. Revised November 9, 2016. This website is published by Life Assurance Ministries, Camp Verde, Arizona, USA, the publisher of Proclamation! Magazine. Contact email: BibleStudiesForAdventists@gmail.com.